Conewich bread cones can be shipped frozen with or without fillings. 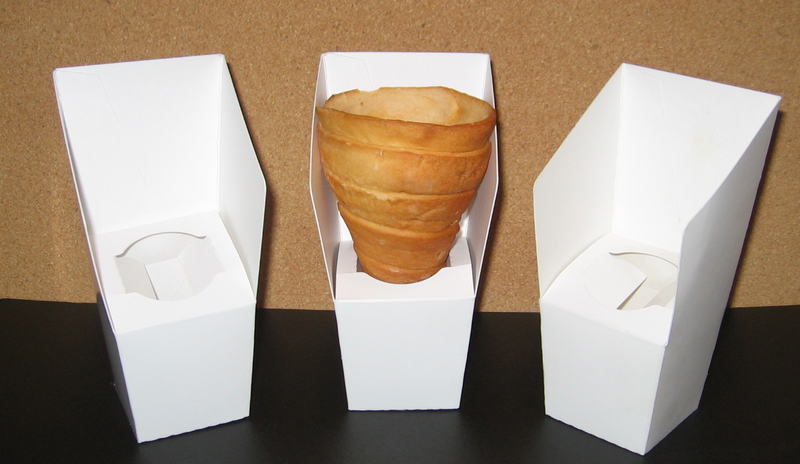 The Conewich bread cone can be packaged individually or in bulk to your specifications. Fillings can be produced to the individual requirements of your customers by USDA approved companies for all occasions: breakfast , lunch, dinner, entree, even appetizers. Filled Conewich bread cones are individually wrapped in a stand-up holder that can be heated in a microwave or oven up to 400 degrees Fahrenheit. We are seeking additional bakeries and food companies in the U.S. and abroad to manufacture, market, sell and distribute the Conewich bread cone.